Bloggers, this one’s for you! Whether you’re hoping to eventually sell programs, coaching, or services, or if you just want to focus on your blog, a book will help you grow your blog and keep reaching new people! This episode is a deep dive into seven big ways that your book will help you grow your blog, including your page views, your revenue, and more! 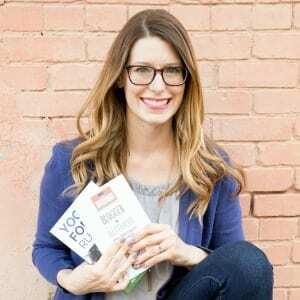 If you’ve been putting off your book because you don’t think it’s going to have a big impact on your blog and business, I think you’ll change your mind after listening to this episode. First and foremost, a book helps you build authority and credibility and this is something that I just mentioned, but I do want to take a minute to talk about it. So really having that book helps you distinguish yourself from everybody else and it helps show people that you are a true expert in your niche, that you know what you’re talking about, and this is especially true when they pick up your book and they see all of the amazing stuff that you’ve put in there. So I’ll give you an example here. My first book was Yoga for runners. Um, it’s still my number one bestselling book because that’s where my audience is. That’s where I have worked to build up, again, my authority and credibility over the years. But one of the best things I did about two and a half years ago was write and publish that book because it’s helped me really build again, my status as an expert. So before that I had been blogging a lot on the subject and really trying to make a name for myself, but there’s only so much that blog post will do. And there’s only so much that sharing on social and you know, getting stuff up on Pinterest, that sort of thing. There’s only so far that that will take you and writing that book is really what catapulted me forward to the point now where I am being approached by media outlets and things like that for quotes and help on articles that deal with Yoga and yoga for runners because they know I have that expert status and that gets into some things I’m going to talk about later, but first and foremost, want to make sure that we talk about authority and credibility because I think it’s something that shouldn’t be minimized and I think it’s incredibly important, especially if you want to really make a name for yourself as a go to expert in your niche and a book will absolutely help you do that. Reason number two that a book helps you build your blog is that it helps set you apart from other bloggers. It makes you special when you have a book and especially when the other bloggers in your niche don’t have a book. This is particularly true if a lot of the bloggers in your niche have a an ebook that maybe they sell on their website, and this is particularly true if it’s a free like mini ebook that they give away as a lead magnet to get people to sign up for their list. Having that physical book, it just sets you apart in. It kind of flips the switch mentally for a lot of people where if you just have an Ebook, if it’s just a pdf, yeah, you might have put a lot of work into that, but for some reason because it’s not tangible, it just sits differently in people’s minds than if you’re able to actually pick up your book and say, yes, this is my book. It’s actually this physical thing that I’m holding in my hands and look at it. There’s like printed words and photos and everything and it just. It makes people look at you differently and this was huge for me. When I first started with that book, Yoga for runners, I would post selfies of me with my books so people could see, yeah, this is actually this physical thing that exists, there’s substance to it, there’s a lot of great information and it just helps again, with that way that people view you in their mind sister to take you more seriously. And it again helps set you apart from other bloggers in your niche who don’t have books and especially also who don’t have printed books, who just have those ebooks. So if you’re one of those people who just has an ebook that you’re selling and you haven’t yet gotten into print, you should definitely work on getting it into print. It’s a lot easier and cheaper than you think it’s going to be. I’ve got some videos that you can look up on this channel where I talk through, um, you know, some of the myths behind getting your book into print, how to do it, that sort of thing. So it goes see those videos. Reason number three that a book helps you build your blog is that it helps you make money. And I know a lot of people write a book to make money. Um, I wouldn’t necessarily say that that should be your first reason why, but it definitely does help you bring in income and it just adds another revenue stream to your business, which is smart, especially for bloggers, you know, you’re probably bringing in a little bit of ad revenue, which I feel like is going down every single year as more and more browsers have ad blockers, that sort of thing. But, you likely have that might have some sponsored posts, you know, you’ve got some different ways that you’re bringing in money. A book is going to add in another stream so that you’re bringing in more money. And so even if it’s not a lot of money, even if it’s like tens of dollars every month or even less, if it happens to be or you know, say you’re bringing in a couple of hundred dollars a month, which is totally possible, especially if you write the right book for the right niche. Um, it’s still bringing in money for you. And so if you are working to build your blog as a business, a book will absolutely help you do that and so you’ll have that money to spend on just like your own personal bills or your own personal spending, but you can also reinvest that into your blog by some courses, by some plugins, by advertising, whatever it is you need, buy a new camera. But just figuring out ways that really you can, you know, you need money to do stuff to make your blog better, right? And so if you have money from your book, you’ll have money to be able to do those things that you have on your want list. Like I do. So, way number four, that a book builds your blog is by helping you sell other things you have in those things. Could be like an eBook or a program or even if you. I’m just really a downloadable. Anything, especially what you can do is you can package those things together. I’ve absolutely done this in the past and I continue to do this where I have packages for my yoga, for runners products and programs and videos where I bundled together, especially the digital book or the digital copy of yoga for runners and so I can put that together with a couple of videos and sell it, which I absolutely do. I’ll occasionally bundle it with a downloadable online program that I have, but what it is is it’s just a way to add more value to the things that I’m already selling and that allows me to increase the perceived value of what I’m selling and really make more sales and make more money. So don’t discount the value of your book and especially the value that it can have. When you bundle it together with the other stuff. You have people love a good deal and that’s what those bundles can do for you. Reason number five, a book helps you build your blog, is that it helps you figure out what content, or it can help you figure out what content to put in your blog. So one of the tricks that I teach to my students is to actually use your book when you’re writing it, to help you fill in a post for your blog and if you’re not sure what to write about, if you have, for example, an outline of everything you want to talk about in your book. If there are ideas that are in that outline that you haven’t yet blogged about, what you can do is post a first draft of that section or that chapter of your book as a blog post. And I’ve done this multiple times. I did that for Yoga for runners. I did that for my book, Mat to Pavement, which is like a deeper dive into some ideas that I talked about in Yoga for Runners. And, I did it for my book Blogger to Author. So I’ve done this multiple times and I think it’s an incredibly smart way to, again, repurpose content, but you’re doing it with a plan, but the ultimate plan of that content being polished and included in your book. So if you are struggling to figure out content ideas or blog post ideas for your blog, go to your book and Number One, if you’ve got that outline in, you need to fill in some places, do that, but also feel free if you’ve already published it, to flip through and say, hmm, is there anything that I could go more into detail on? Is there something where readers have questions or you know, if you’re thinking about writing sql book to be a great way to gauge interest in a sequel and to just get some good information out there. So I’m thinking through again the content that’s already in a previously published book and seeing if there are any slants you can take on it. That can also be a really great way to get ideas for content for your blog and to grow your blog that way in terms of number of posts and then hopefully ideally traffic coming to those blog posts that you’ve written. Reason number six, or way number six, that a book builds your blog is that it can bring in new readers, and this is really true if you get your book on Amazon, which I think every single one of you should do, whether it’s an eBook that you’re getting on KDP, so it’s available to purchase for Kendall or ultimately I really do think just about everybody should get their book into print so that the actual paperback copy is also available on Amazon. Amazon is 100 percent a search engine, but better than that, it’s a search engine where people are going to buy things. So if your book is not on Amazon, you could be losing out on sales. More importantly, you could be losing out on a completely different subset of people who could find you and learn about what you do and what you’re passionate about. When, what you have to teach them. You can find those new people on Amazon who may not have found you otherwise. They may not have found you on a google search or through social media or however else do you get traffic to your blog, but they can find you through Amazon. So it’s a way to find new people when they find you on Amazon, they can then go to your blog. You should always include a, at minimum, a link to your blog and your book. Tell people where they can find you. Ideally, figure out a way to get them on your mailing list. Little aside there had a little tip, um, but so then you can get more people to your blog, get more traffic to your blog and get more fans of your blog both following your blog and on social media from Amazon. So think about it as a new way to source people who are going to become your fans. And my final way, way number seven, that a book helps you build your blog, is that you can grow your social following and even your blog following with giveaways. And I love to do this especially in your own launch, but you can do it at any point. I still occasionally will do a giveaway of my books just to up the interest and remind people that my books exist even years after I have published them. Um, so you can just run it like any other giveaway where you give away, you know, x number of copies of your book, whatever you want to do, one copy, three copies, five copies, you can do the giveaway yourself or you can partner with other influencers. That’s a great way to get a bigger reach. Um, and then simply ask them to follow you. You could have them follow your blog, um, maybe with an RSS feed accumulator like Bloglovin’ or some other way and have them follow you on social however you want to set that up. But it can just be a great piece, a great way to entice people to follow you and for you to expand your reach and build your following that way. Um, so yeah, there’s seven great reasons and it’s certainly not an exhaustive list. There are many more ways that a book can help you build your blog. I hope that you can see that it’s a really, really smart strategy and that you have. So you should write a book. It’s a lot easier than you think. A lot of you probably already have a book in your blog or if you don’t have a complete book, you have at least a majority of a book in your blog, and I think if you sit down and plan out what should go in your book, you will see that they were are actually. You’ve actually created a lot of the content for that book already.